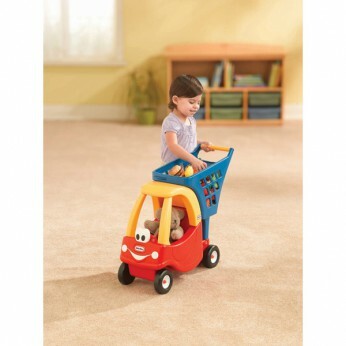 Now you can go shopping with the Cozy Coupe Shopping Cart and your favourite toys. The seat is big enough for a doll or plush toy. Ample space for toys and other small items. Rugged construction to last for many years. Additional storage below basket. Contents not included. 18 Months +…. This toy costs approximately £24.99 (for the latest and best prices make sure you check our retailer list for the Cozy Shopping Cart above). In our review of Cozy Shopping Cart we classed it as being suitable for ages 3 years, 4 years, 5 years, 6 years, 7 years but recommend you check the manufacturer specific advice before purchasing.